Final Expense Insurance is structured in order to cover the final expenses associated with burial and funeral costs, probate charges or other financial concerns that your client’s family may be faced with in the event of a death. Several funeral costs cross over $10,000 and may prove to become a severe financial burden at a time of emotional hardship. 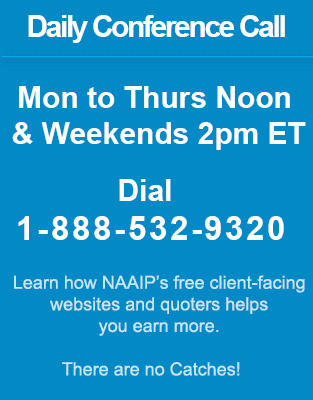 NAAIP brings you a variety of tools to help increase your sales volume. Included in these are Leads, Consumer Data, E-Apps and a Direct Mailing Services. In Addition to these tools are a number of informative resources to educate you on current sales techniques and important news and events updates to make sure you're always a step ahead in this competitive industry. Foresters is a renowned life insurance firm that has provided financial protection for families over the last5 130 years. The Foresters Final Expense product proves highly popular with clients and agents. A worthy addition to any portfolio. Forethought Life Insurance Company with an 'A' (Excellent) rating. This company has been dispensing inventive insurance products since 1985. Since the senior market is developing rapidly, now is a good time to consider Forethought Final Expense. The Gerber Life Guaranteed Life Insurance Plan offers your clients security in knowing that their final expenses are covered, no matter what. Gerber Life's whole life plan will provide up to $25,000 towards leftover debt, medical bills and funeral expenses. ING Life provides final expense insurance with its whole life product. As well as having the security of death benefit throughout your clients' living years, their families will be assisted with final expense payments and funeral costs. Legacy Safeguard not only provides agents with an excellent final expense sales program and training, but also gives your clients the opportunity to leave a lasting legacy behind with a free membership to this excellent plan. Kemper is a leading financial service provider with over $8 billion in assets. They specialize in life and health products as well as property and casualty. They are consistely ranked highly by A.M. The Monumental Life Final Expense insurance product gives your clients peace of mind by easing the financial burden left by final expenses. Funeral costs average almost $7,500 these days, a price tag that doesn't include cemetery fees. Mutual of Omaha’s Final Expense product enables your clients to successfully manage their debts, medical bills or any other unanticipated expenses that might be left after their passing. Another highly popular plan from the Mutual of Omaha group. Sentinel Life Final Expense provides affordable cover to low income seniors. Easily sold over the phone with a voice signature. The New Vantage product is a popular addition to agents' portfolios. Based at comparatively low costs, it caters effectively to those seniors’ needs who are considering their family's protection after their death. Stonebridge Life offers applicants comprehensive, affordable life insurance plans to suit every budget and situation. Policyholders will benefit from secured finances right up to retirement age and beyond. Final expense insurance is oriented towards those clients who wish for final expenses coverage and wish to avoid full underwriting. Moreover, customers who have been earlier refused coverage with one provider may find another. Final expense insurance products usually don’t involve a formal medical exam, hence, many customers find it easier to qualify for these plans. In addition, the guaranteed premiums make this investment predictable and of low-risk for clients. For agents: superb MGA commissions in the 120 FEX Club, simple underwriting and electronic/phone applications are generally offered with final expense insurance. The premiums are competitive as compared to other insurance policies. These useful plans offer your clients a cost-effective alternative to whole life products. * The information provided is intended for licensed insurance agents only. It is not intended for the purpose of advertising the insurance products to the general public.